The Redmi Note 5 Pro is Xiaomi's strongest showing in the budget segment in the last two years, and puts the brand in a great position as we head into the launch cycle for 2018. The 18:9 display is a much-needed change to keep the device competitive, and the Snapdragon 636 ensures class-leading performance for the foreseeable future. With the Redmi Note 5 Pro, the manufacturer is taking the lead in this category, and once again setting the benchmark for the rest of the field to follow. 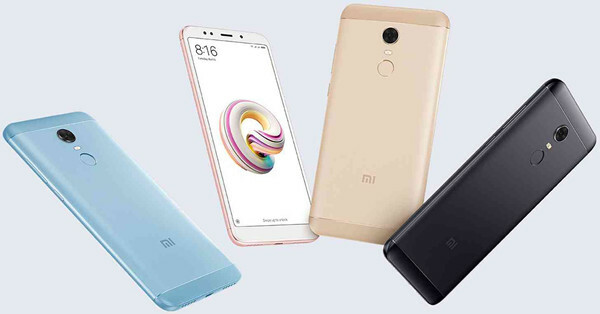 Let's learn how to import photos to Redmi Note 5 Pro through this article. If you'd prefer to select the willing one to transfer rather than transfer all of them when transfer photos to your device, you can try with Syncios Manager to achieve it. First of all, you need to download and install Syncios Manager on your computer. Launch Syncios Manager and connect Xiaomi Redmi Note 5 Pro to computer. If you have any detection problem, please click here for help. After all the sync work finished, you will see five categories showing on the left panel. Choose 'Photos' option and wait for the next step. Add Photo Album: Click 'Add' button on the menu bar and then select 'Add folder' option. Then select the photo album you want and click 'OK' to import. 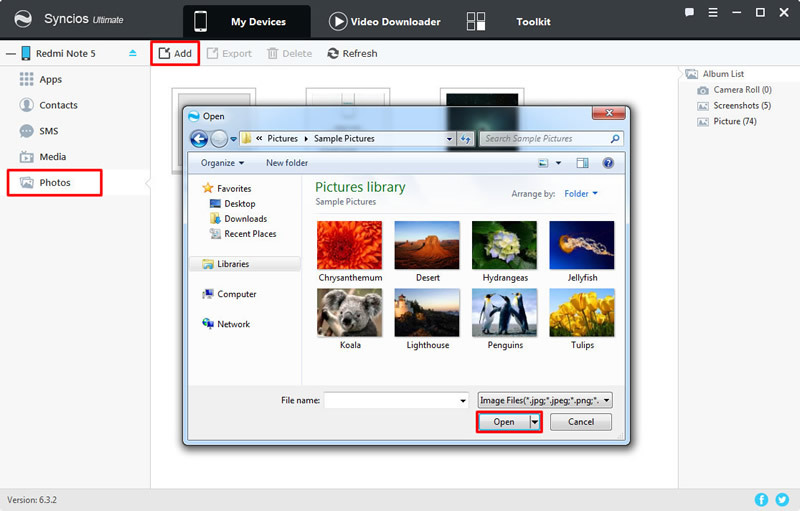 Add Photo File: Double click the certain photo album and enter it. Then click 'Add' button on the menu bar and select 'Add file' option. Choose the specific photos you want and click 'Open'. Syncios Manager also contains the '1-Click Restore' function. Yep, it can restore the backups you've made before to Redmi Note 5 Pro in only one click operation. Step 1: This time we will select 'Toolkit' on the menu bar then select '1-Click Restore' function. 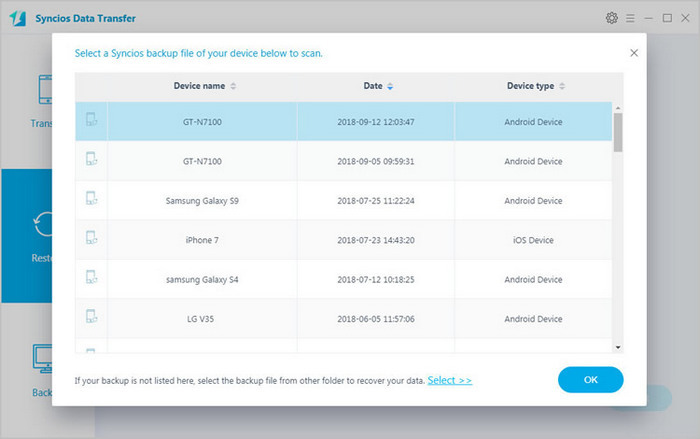 Step 2: All the backups you have made by Syncios Manager's 1-Click Backup will show on the screen, choose the certain photo backups and click 'Next'. Select 'Photos' and click 'Start Recover' to launch the transferring process. 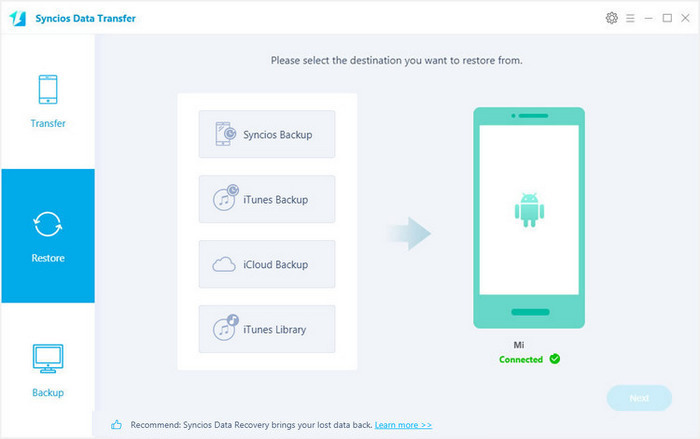 You can restore photos backups to Redmi Note 5 Pro under the help of Syncios Data Transfer. You can also backup Redmi Note 5 Pro if you need. 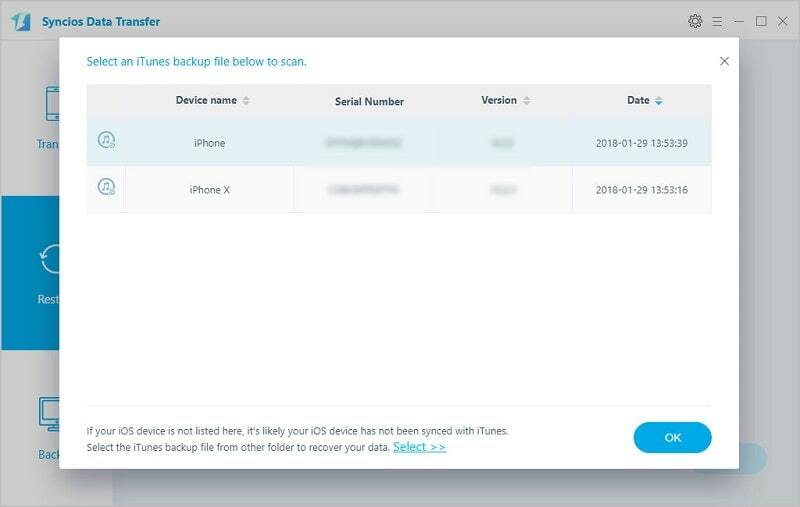 What's more, iCloud and iTunes backups can also restore back to your phone. The pre-condition to use this method is that you must have used Syncios Data Transfer to make any backups before. Choose 'Restore from PC' function and connect Redmi Note 5 Pro to computer via USB cable or using Wi-Fi connection. (Only when Redmi and computer are access to the same network can Wi-Fi connection works). 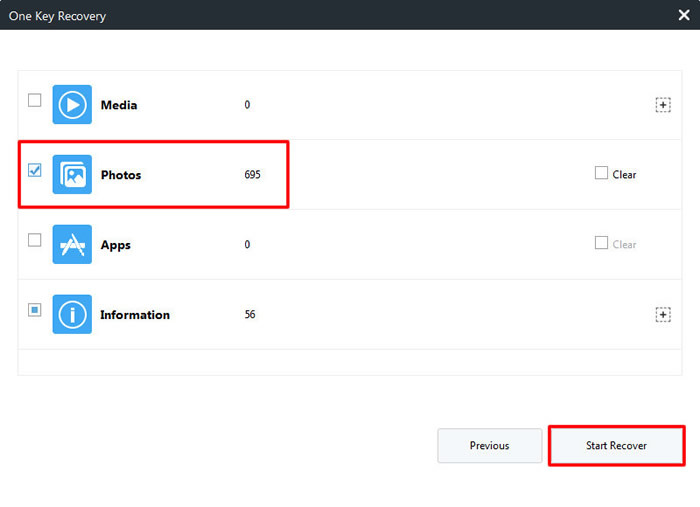 Then select the certain photo backups you want ('DCIM photos' or 'pictures' is checkup by default). Click 'Next' to launch the transferring process. 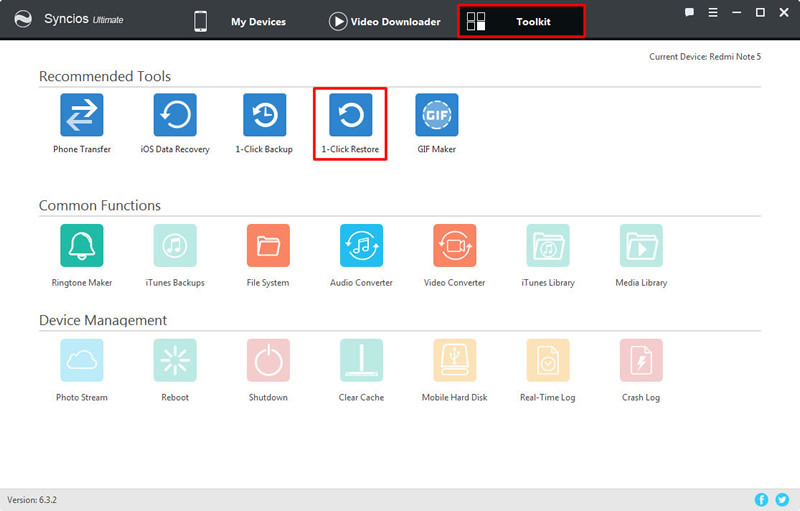 Choose 'from iTunes backup' function at the first interface and connect Redmi Note 5 Pro to computer. Once Syncios finish to synchronize your phone, all the backups you have made by iTunes before will listed on the left side. 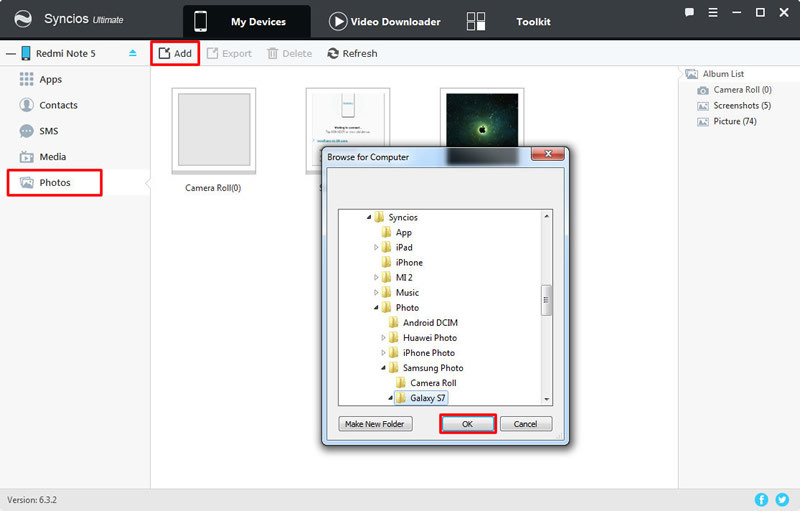 Then select the certain photo backups you want ('Camera Roll' or 'Photo Library' is checkup by default). Click 'Next' to launch the transferring process. Xiaomi Mi 2/2A/3/4/4i/4C/4S/5/5S/5C/6/A1, Xioami Mi MIX/Mix 2, Xiaomi Mi Max/Max 2, Redmi 2/2A/3/3X/3S Prime/3S/3 Pro/4/4X, Redmi Note 2/3/4/5, Mi Note/Note 2/Note 3, Redmi Pro, etc.